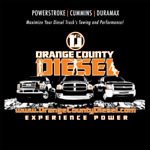 Air Lift is focused on providing the equipment to make towing balanced and peaceful. The AL 57395 LoadLIFTER 5000 Rear Air Spring Kit is an easy-to-install air spring kit for leaf spring vehicles. The springs are for the heaviest towing, capable of aiding a haul up to 5,000 pounds. Towing a large haul can make driving a hassle, as headlights are skewed upwards and the vehicle is bent back downwards. The AL 57395 solves these problems with its air springs that inflate in your vehicle, providing extra suspension. The air springs stabilize vehicles hauling large objects, leveling them with the road. With the AL 57395 LoadLIFTER 5000 Rear Air Spring Kit installed, driving with super heavy haul is as easy as driving without one. 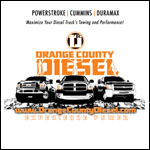 OC DIESEL offers Professional Air Lift 57395 LoadLIFTER 5000 Rear Air Spring Kit installation.